For the first time in 4 years, the Cache Creek Wilderness Run has been predictably running at a level that is fun for a day trip. 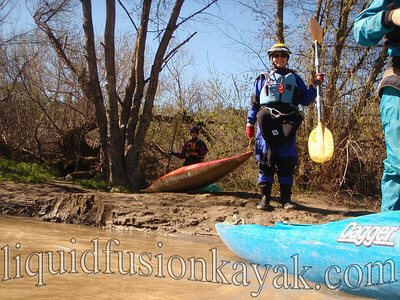 When one of our paddling friends emailed about doing it on a day our calendar was clear, we jumped on the opportunity. Clear Lake is over its capacity so they have been releasing over 3,000 cfs from the dam for the past week. Combined with flow from the North Fork, we estimated that our flow was approximately 3800 cfs. As we met at the put-in, what to wear was the debate of the day. Being that we were embarking on an 18 mile wilderness run that hasn't been run (to our knowledge) in several years and that only 2 of the 4 of us had run it over 4 years ago, we weren't sure what to expect. 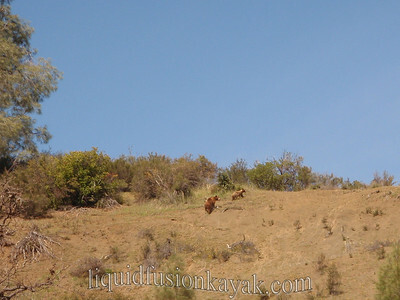 Down trees and landslides can occur and greatly change the character of a run. We knew the flow was going to be swift with the dam release and looking at the flow coming down the creek at the take-out. Prudence would have us dressing for the worst case scenario and potential immersion. Most of the group opted for drysuits, but I went with my drytop and farmer jane. Eighty degrees and sunny are not my usual boating conditions so if I got hot, I wanted to be able to get wet. 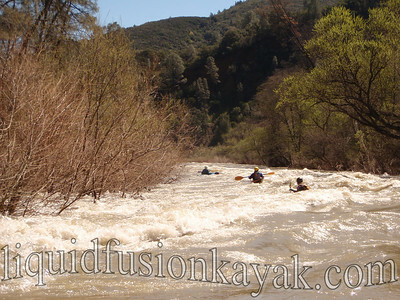 This run is described as a class II(III) by American Whitewater and California Creeks. 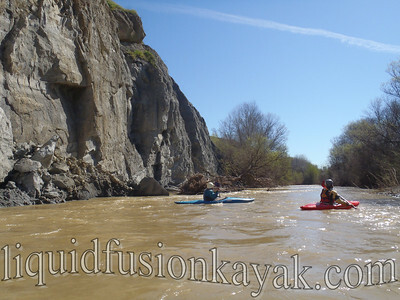 It is fun to look at the photos on the CA Creeks site which are at low water and over 3000 cfs lower than what we were running it. 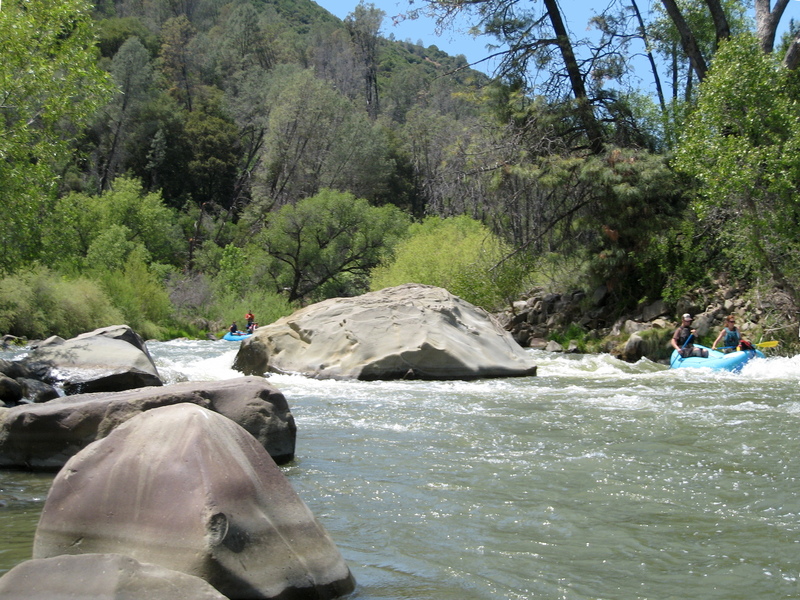 During our run, the "Big Rock" in Bill Tuthill's CA Creeks write-up was not visible creating a pour-over and large hydraulic. As we launched, we were apprehensive about the possibility of down trees and strainer hazards in the muddy waters. The flow on the North Fork moved us along at a comfortable pace as we cautiously boat scouted blind turns and brushy channels. We enjoyed the sweet sounds of western meadow larks singing and a slight warm breeze that rippled through the budding willows and alders. The landscape of steep open hillsides was quite different from the mossy forests of our typical Mendocino County wilderness runs. Evidence of volcanic activity was evident in the geology. At one point, the creek cut through a bank of ashfall. 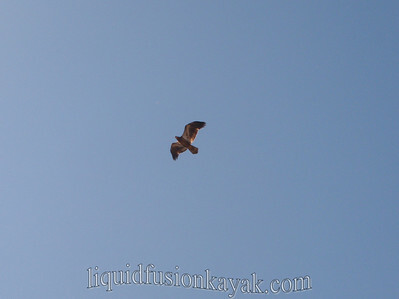 As we bobbed along the North Fork, we continuously scanned the trees and skies for bald eagles. We saw 2 driving to the put-in and hoped to see some more. 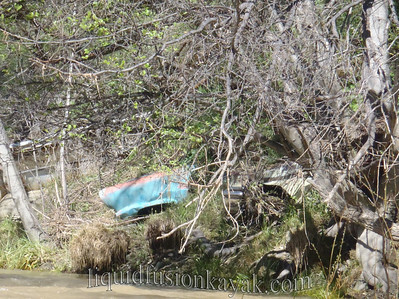 At one point, the creek bank was not the usual rocks and trees but was built of old automobiles. The vegetation has grown around and through the cars. It is novel, but probably not the most environmentally conscious way for the property owner to stabilize the creek bank. 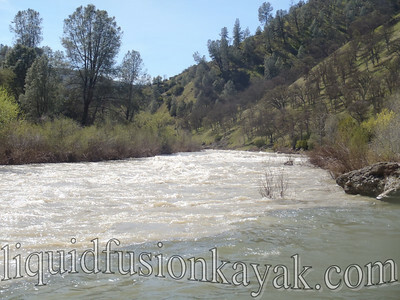 The character of the run changed significantly when we hit the main branch of Cache Creek (changed to the tune of about 3500 more cfs). The creek was definitely moving along at a good clip and above its regular channel and flowing through the trees and brush at its edges. Few eddies existed along its edges as did opportunities for landing. There was quite a bit of squirrelly water where water flowed over submerged rocks and where channels converged. The squirrelly waters of one of these convergences grabbed one of my edges and gave me a quick dunk. All 4 of us enjoyed watching for birds. A pair of accipters had us debating between cooper's or sharp shinned hawks. We were delighted with siting of over 1/2 dozen bald eagles (like the photograph below, some were juveniles and weren't so bald). The highlight of the day was seeing a bear and her cub. Unfortunately, I don't think that we were the highlight of their day as they appeared alarmed by our presence and galloped up the hillside. The rapids on the run were quite rapid. The bigger ones were mostly giant wave trains with an occasional hydraulic to keep one on their toes. 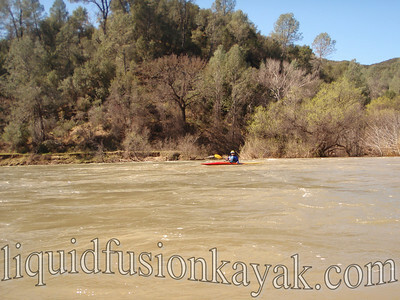 At this flow, we were flying along but one would expect that some might be fun to play on at a lower flow. Not many wave surfing opportunities. Jeff happened to catch a photo of this wave as we breezed past it. 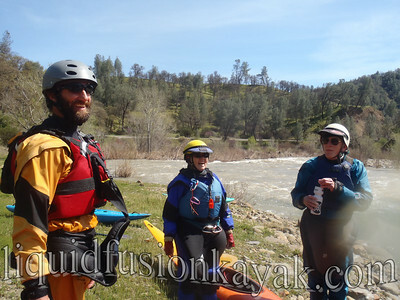 Knowing that it was an 18 mile run and not knowing what hazards we would come across on the river, we had expected it to be a long paddle. It ended up being the fastest 18 miles any of us had done on a river - we did it in 3 1/2 hours with a lunch break and a stretch break. 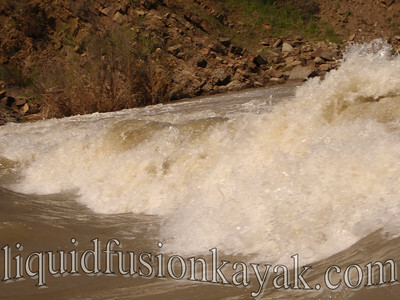 They are still releasing 3000 cfs from Clear Lake into Cache Creek and it is still runnable. A boating buddy of ours asked if we wanted to run it with him this week - we declined. 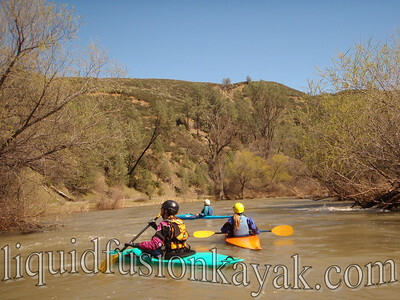 We had a great day on the river and enjoyed the run but are looking forward to exploring some other local runs. Thanks for reading my post. I am glad that you enjoyed it. 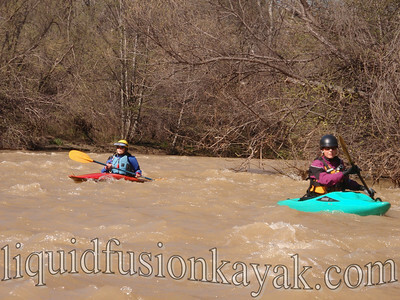 I would say that Class II whitewater skills (being able to read water and keep a line to avoid brush and hydraulic hazards) would be adequate when paddling with a group of similar or more skilled paddlers. This is a wilderness stretch so some wilderness skills including rescue and first aid among group members would be good for peace of mind. The Adventure has Begun . . .